Russia’s withdrawal of its air group from Syria occurred as it accomplished what it set out to do, in terms of destroying ISIS and launching the peace talks by compelling the warring parties to begin negotiations. Turkey remains unhappy with the outcome, as the interests of its leadership have been severely hurt. Turkey right from the start bet on the Islamist opposition which was receiving aid from mainly Saudi Arabia. Hoping to carry out a quick overthrow of the Assad regime following the so-called “Arab Spring” blueprint, Turkey sacrificed the just recently launched positive trend in the bilateral relations and shifted from a restrained “no problems with neighbors” policy to a more offensive one, evidently hoping that it would have enough resources to “establish order” in Syria not through the usual “soft power” approach but through forceful means. By making that shift, Turkey openly launched its “neo-Ottoman” project which assumes bringing neighboring countries into Turkey’s orbit by any means available. However, Turkey did not anticipate Russia’s role, which just then was shifting from a defensive to an offensive foreign policy posture. Right from the start of its involvement in Syria, Turkey encountered Kurdish resistance in their own country, who have grown disappointed with the regime. Remarkably, one of the Erdogan regime’s first political reforms was the so-called “Kurdish breakthrough” which even included the permission for broadcasting and teaching in Kurdish languages. Erdogan was one of the first to abandon the “Mountain Turk” label which was demanded by the Turkish constitution proclaiming all Turkey’s citizens to be “Turks.” By involving the Kurds in the political and economic life, the leadership was hoping to resolve the long-standing conflict, but in the process of developing the new constitution which is still being discussed today the Turkish establishment made it clear that the Kurdish people would not be granted even the slightest autonomy. 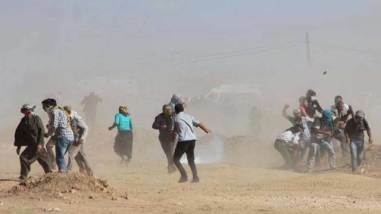 Moreover, Turkey’s government actively combated all dissident Kurds and launched military strikes against their Iraqi brethren under the pretext of fighting terrorism. Right now there is a civil war in Turkey’s south-east which is covered up by the ban on media broadcasts in Kurdish areas. Judging by the events in Jisra, where hundreds were killed by Turkish soldiers, the country’s leadership decided to suppress the protests through direct military action. Erdogan’s regime simultaneously began to shell Syrian Kurds, believing that it can use force to prevent the formation of Syrian Kurds’ autonomous enclaves, but in actuality it only intensified Kurdish resistance within Turkey thus, wittingly or not, it facilitating the US plan to create a Greater Kurdistan. The shelling of Syrian Kurds is driven by the Turkish regime’s fear of Kurdish autonomies on its own borders, which it views as a threat to national security. Which is why there’s a reversal of terms: Erdogan refers to Kurdish forces fighting in northern Syria as ISIS collaborators. Moreover, now that Erdogan’s regime is losing international legitimacy and is trying to remind everyone of its existence by allowing its close associates to claim that the time Turkey used to defer to the US has ended, it is clearly forgetting that his personal fortunes very much depend on US favor now that his destructive policies have undone his earlier gains which included good relations with Russia. The Kurdish question will play an important role in Geneva because this is how the international community will attempt to pressure the Turkish government which is trying to portray itself as the victim of Kurdish terrorism and the main ISIS fighter, even as Turkey, which used to be a bulwark of stability in the region, is plunging the region into chaos with its rash actions. It’s becoming clear that resistance against the regime’s destructive policies is on the increase in Turkey. It is evident through the increase in nationalist sentiments which are being fanned by the regime, the opposition’s statements condemning Turkish regional policies, and the intelligentsia growing weary of regime increasing its powers after every terrorist attack. In the short term one should expect the destructive internal Turkish trends to increase. The society is heavily polarized on many questions, it is flooded by not always peaceful migrants, and it is having to deal with the rash anti-Kurdish policies which have forced the Kurds to move to big cities. It is also evident that the regime is trying to use the Kurdish question as a means of exerting influence over the region, which means we should expect the use of force and attempts to interfere with the Syria peace process. After making a major investment in the Syria war, the Turkish leadership is not about to watch it from afar but may instead shift to more active measures, including military intervention, especially once it realizes that it is at a dead end. European concessions can hardly reduce Ankara’s aggressiveness. Rather the opposite—they will only encourage Turkey’s leaders to become more active to the point of sending the army into Iraq or committing genocide on the Kurds, both in Iraq and in Turkey.